Aluminium picket fencing is versatile, durable and comes in a range of colours to match any stylish pool or landscaped area. It strikes the perfect balance between smart security and low maintenance, while also providing that classic look only a picket style fence can provide. We manufacture all our own steel fencing products at our factory in Hoppers Crossing. It means Everlast can stand by the quality 100%. Our Australian materials are all built to strict standards to ensure the highest durability, toughness and strength to hold up for longer. Everlast offers plenty of picket fencing options for your next outdoor project including flat top, picket top, loop top and more. All aluminium panels are powder-coated and reinforced for a superior finish that enhances the look and feel of your home. Why Use Aluminium Picket Fencing? An aluminium picket fence in Melbourne doesn’t need constant washing. They’re very low maintenance – a simple hose-down washes off all dirt and blemishes. They won’t peel, dry out or require new coats of paint. Aluminium looks just as good 20 years from now as is does today. They are ideal for Australian weather. As well as standing up under extreme sun, aluminium is unaffected by the cold, rain, or heavy winds. Aluminium style picket fencing is perfect for home owners wanting a classic finish with the convenience of a contemporary material. It offers a longer life with less maintenance, making it the best value for money in the long run. 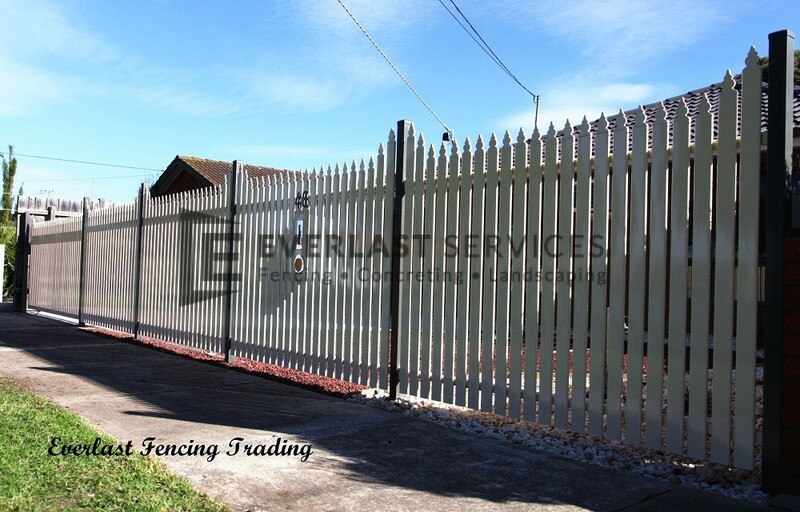 Everlast has over 20 years of experience providing quality fencing solutions in the Western suburbs of Melbourne. We know exactly what our customers need and how to help them create a fence to be proud of. We’re the leaders for aluminium picket fencing in Melbourne – because our materials are all manufactured by us, right here in Hoppers Crossing. It means you get the most durable and quality-tested products for the lowest prices. We are a family owned and operated company, and always will be. Our local experts are always here to answer questions, offer you personal support and help you with your latest project. Everlast do more than just fencing. You can trust us for landscaping, concreting, decking and more. We’re a one-stop-shop, which means lower prices and more holistic service and advice.